Polish democracy icon and former president Lech Walesa on Saturday joined the protests that have broken out across Poland over plans by the populist ruling party to put the Supreme Court and the rest of the judicial system under the party’s political control. The European Union and many international legal experts say the changes would mark a dramatic reversal for a country hailed as a model of democratic transition over the past quarter century, and move Poland closer toward authoritarianism. In Warsaw, 29-year-old lawyer Marzena Wojtczak disputed the ruling party’s claim that the judicial system was filled with former communists, saying many judges had been anti-communist dissidents and others are too young for that era. Three bills changing the rules for the Supreme Court and other judicial bodies have been approved by Polish lawmakers but they must still be signed into law by President Andrzej Duda. The protesters, bearing signs “3 X veto,” urged him to block the legislation. The Supreme Court has, among other powers, jurisdiction over the validity of elections. Government critics fear the ruling party could abuse its new power and falsify future elections. After the populist Law and Justice party won power in 2015, it took on the country’s system of checks and balances as it sought to cement its power, often passing contentious laws in the middle of the night and without any public consultation. Those steps have led to repeated street demonstrations. The party has turned public media into a party mouthpiece and purged the army of most of its leadership. Most dramatically, many critics say, it has already neutralized the power of the Constitutional Tribunal to block any new legislation that might violate the constitution. On Saturday, presidential spokesman Krzysztof Lapinski said Duda sees some flaws in the legislation on the Supreme Court. But he stopped short of saying whether the president would reject the bill or seek the opinion of the Constitutional Tribunal. Duda has 21 days to sign the bill into law. Although the European Commission has expressed its concerns about Poland’s judicial changes and recently threatened to strip Poland of its EU voting rights, it has so far been powerless to do anything. Any sanctions would require unanimity of the remaining 27 EU members. Former President Lech Walesa Urges Protesters in Poland to Defend Democracy. 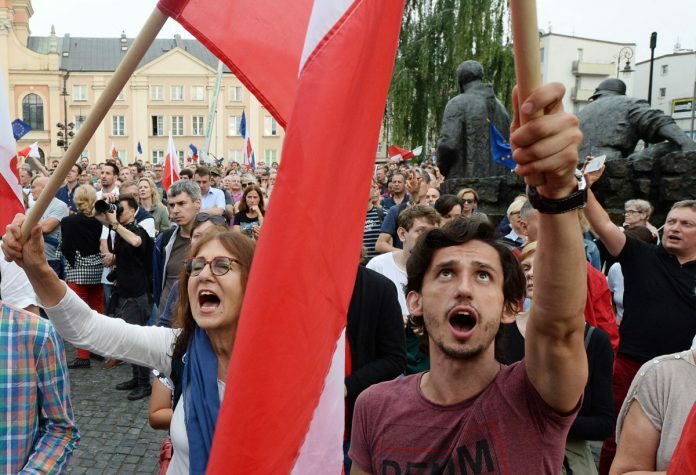 Protests have broken out across Poland against the populist ruling party.